Check out our top holiday gifts for your favorite foodies. Short on ideas for what to make or give your favorite foodies? Let us help. EatingWell has 13 suggestions to help you make your own or find the perfect gift, no matter what your price range. From under $5 to $60, these are delicious gifts given in good health. Download a FREE Homemade Gifts Cookbook! Watch us make chocolate bark. Easy enough for kids to make, and delicious for breakfast or over low-fat vanilla yogurt, granola is a healthy homemade gift for everyone on your list. We love the maple-nut flavor combination of this heart-healthy granola, but feel free to substitute your favorite nuts or dried fruit for your own custom blend. Find a gift tag here. This hearty soup makes an attractive homemade gift with layers of beans, barley and spices. Making your own dry soup mix from beans and spices couldn't be easier. In an attractive clear glass jar (such as a Ball jar), layer the beans, barley and spices to artfully display the various shapes, sizes and colors. Add a ribbon and tag and you have a thoughtful and tasty gift for your coworkers. Give your friends the flavors of the season. The compote is equally delicious as a condiment on a cheese plate, as an accompaniment for roast pork or as a spread on toast. Cook the figs in this compote down until they can be spread with a knife or spoon. If you're giving this as a gift, include a card with serving suggestions. 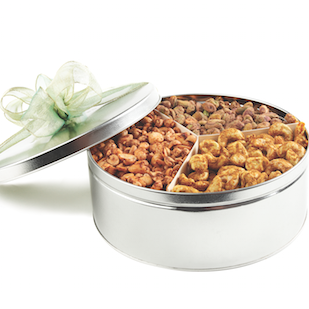 For the nut lover in your life, make this easy and delicious recipe. Here are our favorite flavor combinations for spiced nuts, but feel free to experiment with different nut and spice combos. Use our master method and keep the ratio of nuts, seasoning and liquid the same. Friends and family who are passionate about lifelong healthy eating and great tasting food will love a gift of EatingWell! 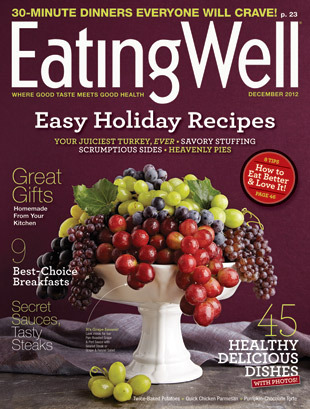 EatingWell Magazine provides readers with the inspiration and information they need to make healthy eating a way of life. Each issue is full of delicious easy recipes that meet high standards of taste and nutrition. Readers learn to make informed decisions about how they eat and to celebrate the joys of food. Click here to fill out your gift list today. These infused vinegar recipes are the perfect homemade, natural gift for all the cooks in your life. What do you get when you combine vinegar, a few easy-to-find ingredients and a dash of ingenuity? Infused vinegars that will add panache to salads, steamed veggies, soups and sauces. Help your friends stay healthy and organized in the new year with the EatingWell 2013 Wall Calendar. At EatingWell, we believe healthy eating should taste great. And our 2013 calendar demonstrates that it can look remarkably good too. From juicy January citrus to a delicate December pear, these sumptuous photographs capture the delicious beauty of fresh fruits and vegetables at the height of their season. Each month delivers a gorgeous image and a tantalizing recipe suggestion. A great gift for everyone who loves to eat! Give this calendar to someone you care about and help them to eat well, every day. Help prevent lemon juicing accidents— spraying juice in your eyes. This affordable gift will make juicing lemons a squeeze. 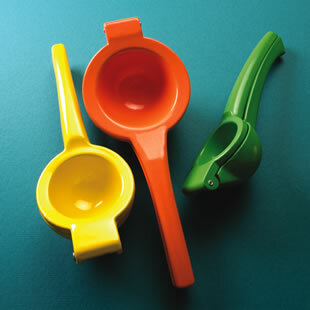 To use these colorful, easy-to-use, hand-held Citrus Juicers by Amco Houseworks (surlatable.com, $12.95-$15.95), simply slice an orange, lemon or lime in half, place it into the durable, enamel-coated gadget and squeeze. The tool turns the citrus half inside out, neatly extracts all the juice and leaves the pulp and seeds behind. Cleanup is easy; these are dishwasher-safe with a finish that won't rust. When you see all the amazing lemon recipes in our next issue, you'll have plenty of sweet and savory ways to put it to work. Make a donation to Feeding America, the nation's largest domestic hunger-relief charity and the provider of more than 200 food banks. According to the USDA, one in six Americans suffers from food insecurity, and one in four children live in a food-insecure household. To help change that, order gift cards and donate what you would spend on a meal ($25, $50 or more) in a friend or family member's name. What is better than giving your friends enough healthy recipes for an entire year and then some? The Simple Art of EatingWell Cookbook is a great gift for any foodie in your life. It makes healthy cooking accessible and is the definitive go-to guide every home cook should have today. 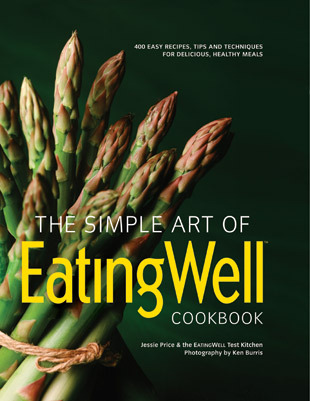 This book includes over 400 of our best recipes and advice from nearly 20 years of testing and developing recipes at EatingWell. Many of the recipes come from the nation's top chefs and recipe developers, including Rick Bayless, Nancy Baggett, Bruce Aidells and Alice Waters. If you want to give the gift of healthy eating, this is the book. This gift will help your friends and family prepare healthy and convenient dinners while carrying on with their busy lives. The EatingWell Test Kitchen cooks like the programmable 6 quart Smart-Pot Slow Cooker from Crock Pot ($60). Several bells and whistles make this one a winner: a digital touchpad that allows the user a to control the heat settings and time cooking in increments of 30 minutes up to 20 hours, and the automatic shift to warm setting which allows a meal to cook for its pre-determined time and then switch to a temperature that will keep the food at a safe temperature until dinner time. 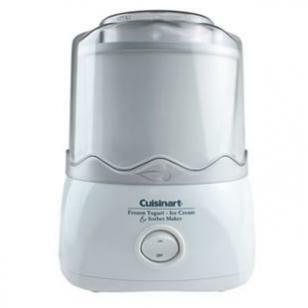 Even if it's cold, an automatic ice cream maker is a great gift for those dessert lovers on your gift list. Gifts should be about giving the recipient something that they will really like but may not make or buy for themselves. An ice cream maker may be just that item for the dessert lover in your life. When it's time for a special treat, it's hard to beat homemade ice cream, frozen yogurt or sorbet. With automatic ice cream makers there is no need to add salt and ice—just fill the frozen bowl with a favorite creamy mixture, turn on the motor and in about 30 minutes, they'll have a custom-made frozen treat ready to enjoy. The EatingWell Test Kitchen cooks like the one pictured here, from Cuisinart ($49.95), Find this model and others at amazon.com. A great alternative to giving something to friends and family is inviting them over for a healthy and delicious festive meal. Let us help you with our creative holiday recipes.